I'm by no stretch of the imagination famous. But I do believe in using whatever platform one has to promote causes that are important to them. As a (skin) cancer survivor and someone who has lost friends and colleagues to breast cancer, I believe in the importance of raising awareness for breast cancer prevention and supporting innovations in treatment and advances in research. This lead me to create a Special Challenge. I've named this challenge, Brave Angel. If you're not familiar with the challenges, they are a fun way to push yourself creatively and create from an assortment of pre-selected components. This challenge is designed to help raise awareness for breast cancer prevention and participants will have the option of auctioning off their creations to donate to a charity of their choice. The creations that I make will be auctioned off and proceeds will go to the Breast Cancer Research Foundation. To participate, you must purchase a Design Kit. This kit features a vibrant selection of premium Czech glass (both old and vintage), vintage acrylic, raspberry quartz, waxed cotton, Javanese glass, vintage seed beads, recycled sari silk ribbon, dyed jade and a Luxury Bead Blend. The Luxury Bead Blend consists of Japanese Miyuki seed beads, Toho seed beads, Japanese Matsuno seed beads, vintage Czech seed beads, freshwater pearls, glass pearls, Czech glass (both old and new), rose quartz, wood, stone, vintage sequins, German glass, vintage plastic, Swarovski crystals, vintage Japanese glass, Javanese glass, and vintage lucite. But that's not it! Each kit includes a special, handmade Mystery Component! The component is a secret until arrives at your door! The Mystery Component will publicly be revealed Monday, October 12th, 2015! 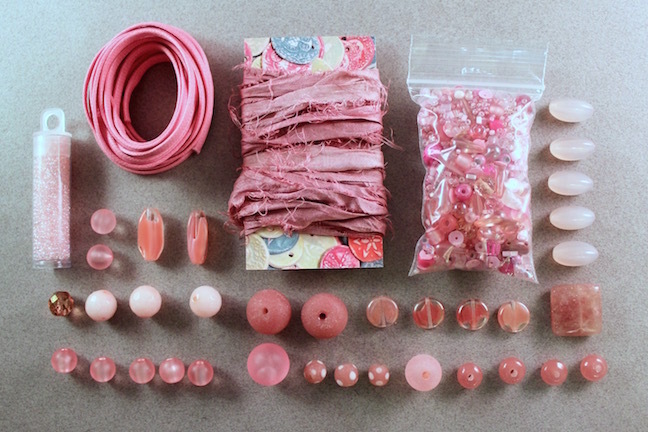 The inspiration behind this kit is of course the color pink. I used the Pantone 2015 Color Reports for spring and fall and pulled Strawberry Ice and Cashmere Rose as a starting point. I don't work with a lot of pink, so this will be an extra challenge for me! But it's an important cause and I hope I can raise money for breast cancer research and treatment! With your kit, using as much or as little of it as you like, create a piece that showcases your creativity, individuality, and artistic expression. 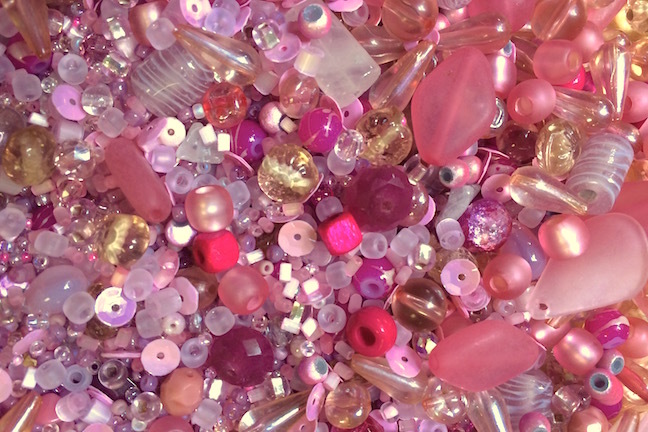 Ideally your creation will spotlight the fantastic assortment of beads included in the kit, but the sky is the limit with what you can create. Feel free to use beads from your own stash to supplement the offered selection. Whether you use a little or a lot of the kit, make sure you keep your project a secret until the reveal date! The reveal date is set for Thursday, October 29th, 2015! Post a picture on your blog or send one to me to post on your behalf (if you don't have a blog of your own). 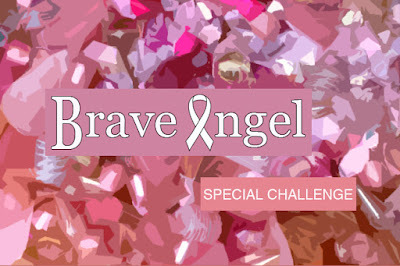 The Brave Angel Special Challenge will end in a blog hop, sharing all the lovely things made with your kit with your fellow participants. I also wanted to mention that all the Design Kits will be shipped with Priority Mail. This can take anywhere from one business day to fourteen. For international participants, it may take longer! If you know that it takes a long time to reach your destination (from Southwestern Pennsylvania) please place your orders early! I will do my best to get your kits out as early as possible, but unfortunately we can't be held responsible if it arrives late due to the postal service. All sales of the Design Kits are final and there are no returns or exchanges. Sorry! With all that being said... we hope you have a great time working with the kit and have a lot of fun! We are super excited to see what you create! Will you be hosting the auction? What I've found to work best is having everyone conduct their own and donate the money on their own. This way they can write off the amount for their taxes if they so desire. I really can't commit to running multiple auctions. I will help cross promote and will also make a badge for folks who are auctioning items though. And the auctions are completely optional for participants.